Q. I was reading about the Navient lawsuit but also received a text in regards to it and wanted to understand this better. I’ve been paying this one loan for what seems like forever. And my payments will be going up soon, which will be hard for me. I do pay extra each month. This loan started out at about 30k and then I look at my account it’s at 50k, but seeing when I’ll be done paying I’ll end up paying over 90k. I don’t know my options but I’m hoping I have some. I was in the military and my recruiter forgot to put my school loan on the paperwork therefore the Army couldn’t pay for it, unfortunately. Are there any options for me? Anything I can do? When it comes to student loan repayment, the burden of finding the best solutions is often on the student’s shoulders. The good news is that you still have options to help you manage your student loans. As you’ve probably heard, Navient has been sued by the Consumer Financial Protection Bureau (CFPB) and a couple of states. These lawsuits allege that the servicer has been engaged in unlawful business practices and misinformation that have cost borrowers millions of dollars, charges which Navient denies. Although deliberations are underway, it seems that there’s no resolution in sight. And even if there was, it would not help student loan holders directly just yet. So, what does this mean for you? For starters, you’ll have to be extra vigilant when dealing with your servicer while maintaining a detailed paper trail of your communication with them at all times. You should also reach out to your servicer immediately and make sure they are following your payment instructions. For instance, you should double check that the extra money you are sending with your monthly payments is being applied exactly how you want. If it is not, you should make your request in writing and send it via certified mail. 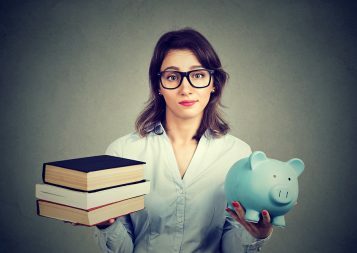 Now, before you start looking for repayment programs, I suggest you gather your student loan documentation and organize your overall finances. There are many plans, including some specific to the military and people who work on the public sector. For instance, there are Student Forgiveness, Income-driven Repayment Plans, and even refinancing options. Each of these plans has very strict application processes and it can be confusing to determine what programs you qualify for. I recommend that you work with a student loan counselor from an NFCC-affiliated nonprofit agency to help you explore your options. As a member of the military, these nonprofits may have specific programs for you, so make sure you ask first. If you prefer to work on your own, you can find out more about some of these options directly with the office of Federal Student Aid online or calling their hotline. You have already started on the right path, push on and good luck!